Durga's Delicacies. Charming to those of Refined Taste. – A diary of my cooking experiences to remember, to share and to learn. 1.Grind coconut green chilli jeera paste in bulk almost all recipes include them. 2.Whisk curd.Add turmeric powder and little salt to it.Most of the recipes need it. 3.Peel small onion,slit green chilli and cut curry leaves . 4 Tempering in a whole Mustard jeera curry leaves and red chilli. Almost all recipes need them .Do it in.one go. 5.Grate coconut may 2 .5 coconuts for 3 to 4 persons meal,the previous day itself. 7.Print out a Onam meal photo and stick it in a place where one can see n serve .The meal should have labelled pictures. 9.Cut vege and arrange in.proper labelled boxes Even plantain and yam can be cut and immersed inturneric added water. 8.Last but not least .Have a happy and open heart n stomach to eat such a wonderful spread.After all we are here to live love and enjoy. 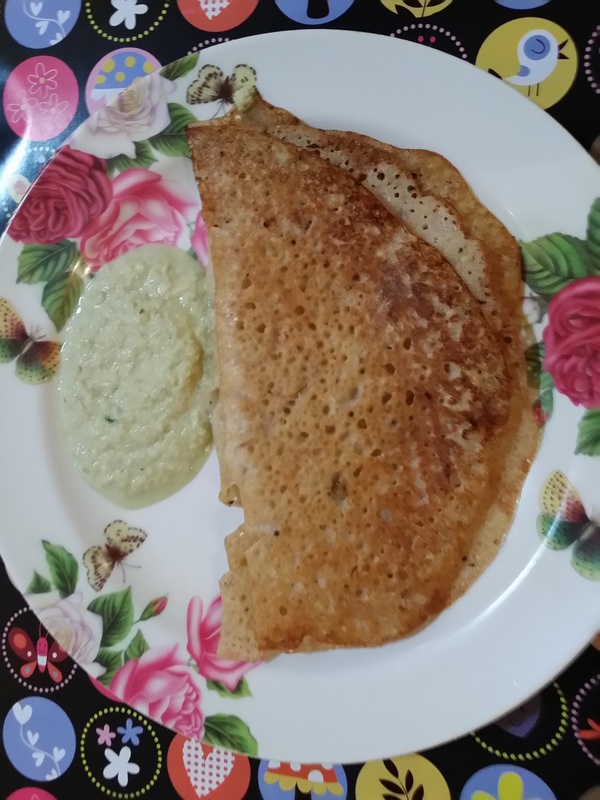 Rava Onion and Oats Dosai. Most ideal one for those unplanned evenings when we feel lazy yet we want a good dinner. Got this idea from Subbus Kitchen . This was actually her version for paniyaaram. i decided to make dosais with this Tasty and very quick food to cook. Now for the recipe. 1. Dry roast the oats in a pan for few minutes and keep it aside. 2. Dry roast semolina/ Rava too in the pan and when cool grind together oats and Rava to a coarse powder. 3.Take this in a mixing bowl and add rice flour, salt and sour curd. Add enough water and mix well. 4. Keep it aside for few minutes. In a pan add oil little enough for seasoning and add mustard seeds, jeera , cut green chilli and onion . Finally add ginger and saute well . Add curry leaves at last and add this to the batter. 5. Take a dosa pan season it with oil and when hot enough pour a ladle of the batter and add a tsp of oil . Cook for few minutes, flip over and cook on the other side. The unique specialty of this dosa is it does not take a long time like our regular dosai or takes oil like Rava Dosai. Serve hot and enjoy on a dull evening.